Overheating symptoms are as follows: • The temperature gauge needle is at the mark or the engine suddenly loses power. 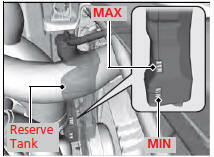 • Steam or spray comes out of the engine compartment. - Steam or spray is present: Turn off the engine and wait until it subsides. Then open the hood. Steam and spray from an overheated engine can seriously scald you. Do not open the hood if steam is coming out. Once the engine has cooled sufficiently, restart it and check the temperature gauge. If the temperature gauge needle has gone down, resume driving. If it has not gone down, contact a dealer for repairs. Removing the radiator cap while the engine is hot can cause the coolant to spray out, seriously scalding you. Always let the engine and radiator cool Reserve down before removing the radiator cap. If the coolant is leaking, contact a dealer for repairs. Use water as an emergency/temporary measure only. Have a dealer flush the system with proper antifreeze as soon as possible.